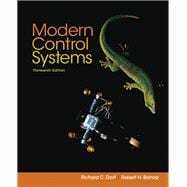 by Dorf, Richard C.; Bishop, Robert H.
The purpose of Dorf’s Modern Control Systems, Thirteenth Edition is to present the structure of feedback control theory and to provide a sequence of exciting discoveries. The book demonstrates various real-world, global engineering problems while touching on evolving design strategies like green technology. Some of the themes at-hand include climate change, clean water, sustainability, waste management, emissions reduction, and minimizing energy. Throughout the text, the reader applies theory to the design and analysis of control systems. The Thirteenth Edition continues to explore the role of and need for automated and precise control systems in green engineering. Key examples of green engineering, such as wind turbine control and the modeling of a photovoltaic generator to achieve maximum power delivery, are discussed in detail. The text is organized around the concept of control systems theory in the context of frequency and time domains. Written to be equally useful for all engineering disciplines, it covers topics such as classical control, employing root locus design, frequency and response design using Bode and Nyquist plots.